Honolulu – O‘ahu residents now have the option to renew their vehicle registration in as little as two minutes at any of four self-service kiosks conveniently located at Safeway supermarkets. •	Two other Safeway locations are being planned. Cars, trucks, trailers and motorcycles can be renewed at the new kiosks, which are blue and yellow machines that look similar to an ATM. To use one, simply type your license plate number on the touch screen, or scan the bar code on your renewal postcard; then pay the fee by credit or debit card. The city will absorb the service and card fees of $3. 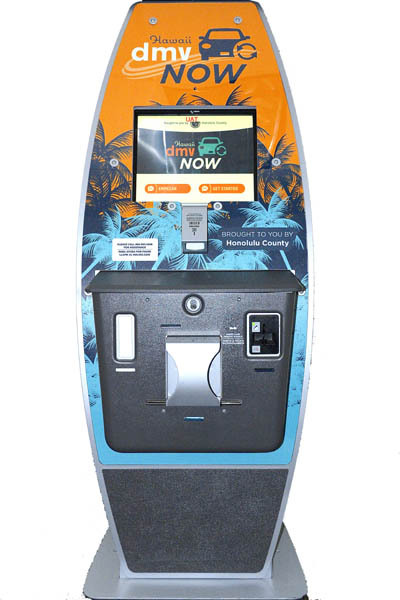 The kiosk will instantly print your receipt, vehicle registration and license plate tabs. Already, motor vehicle registrations can be renewed online, through the mail and in-person at satellite city halls by going to honolulu.gov/csd.